After cooking dozens of vegetables for Christmas guests, I found a plethora of leftover orange veggies that needed to be dealt with soon. So I decided to make a soup. It was so good, it has become a Doe Run Farm speciality. Now this was a "leftover" so exact quantities were not a problem. As you might have figured, we are not big on "exact" measurements. Here are some visuals to give you a hand. I find a baking sheet full of vegetables is about right. 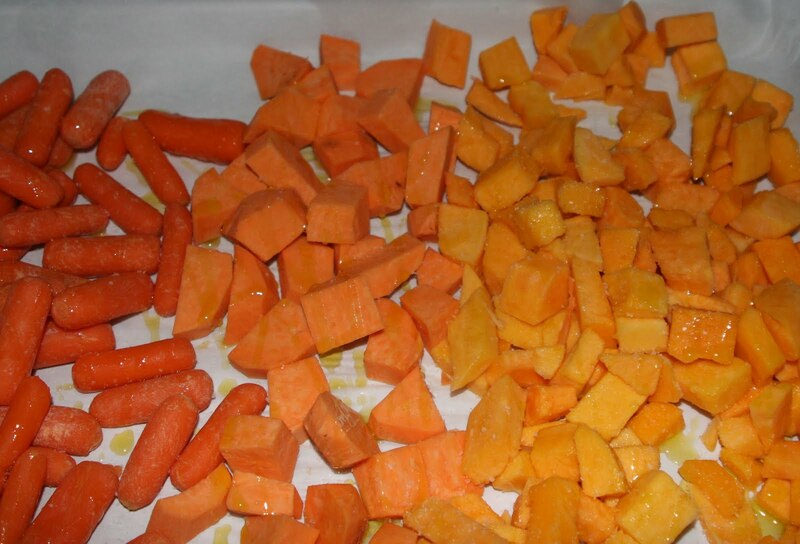 Use any combination of bright orange vegetables. I like squash, sweet potato and carrots. I am sure any one or two will work out just fine. I add one small habanero and a bit of yuzu kosho, which gives it quite a kick. The yuzu kosho and the habanero can be left out, but the joy of this soup is the kick. garlic, habenero, yuzu kosho, onion, butter. Place the veggies on a parchment-lined baking sheet and drizzle on the olive oil. Bake at 375 until fork tender, about 40 minutes. 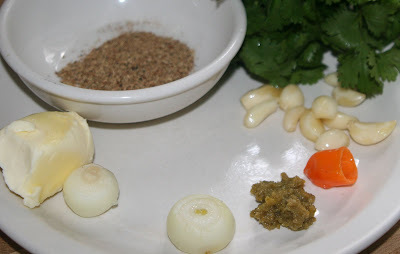 Put the Chinese five -spice, onion, garlic, cilantro, yuzu kosho, and habanero into a food processor and chop roughly. Add the butter to a large soup pot over medium heat. When the butter has melted add the chopped ingredients and saute for a minute or two just to heat, not to brown. 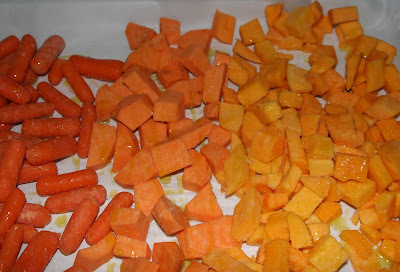 Add the roasted orange vegetables to the pot. Add the two cans of coconut milk and simmer over medium heat for about 15 minutes to blend all the flavors. 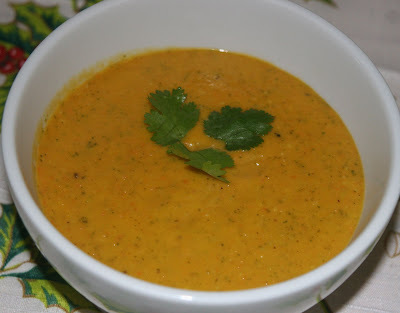 Puree with an immersion blender or remove from heat and carefully blend in batches in a food processor. Not too full or you will have a disaster. Garnish with a few cilantro leaves and serve. On a subsequent batch, I made the soup in a covered Dutch oven. Placed all the orange vegetables in the pot. Quartered the onion and give the cilantro a rough chop and added it to the pot. Add the Chinese five-spice, habanero, and yuzu kosho and sprinkled it all with olive oil and add a nob of butter. Cover the Dutch oven and placed it in a 375 oven for about an hour. When the veggies are tender, remove the Dutch oven to a stove burner. Add the two cans of coconut milk and bring to a simmer. Blend the soup. I like the cook-in-one-pot the best, as you can stick it in the oven and go about your business. And there is less clean up!